"Aromatic, refreshing, quick and very healthy! Not to mention easy too. A side dish that goes with just about any chicken or fish dinner but can also be enjoyed just as a snack. My mother and I came up with this little specialty about a year ago and has become a staple in our meal planning. I get my lavender and fennel from my local health food store. If you don't have grape seed oil you can use olive oil but the grape seed oil is lighter. Also, white wine vinegar works well as a substitute for rice vinegar. If you find the dressing was not enough to saturate all the yam just add more until desired amount and flavor." Mix yam, cranberries, and pecans together in a large bowl. Combine grapeseed oil, vinegar, lemon juice, lavender, fennel, and black pepper in a jar with a lid. Cover and shake until blended. Pour dressing over yam mixture and toss to coat. Chill in refrigerator at least 30 minutes. 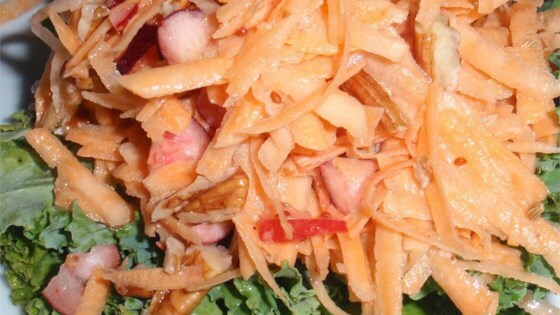 This healthy salad offers a wonderful contrast of flavors and textures. This salad seems to gain flavor the longer it sits. If you are serving as a side dish, prepare it first and let it chill in refrigerator for at least 30 minutes. Crush lavender and fennel using a mortar and pestle, or simply crush them between your fingers, or pulse through a small food processor. The lavender and fennel make this a delightful salad! This is colorful and tasty! Needs more dressing if using a fennel bulb which I did.